Ekal Kumbh was once in a life time experience for me. It was a true reflection of Ekal power, strength, progress, dedication, discipline & determination. 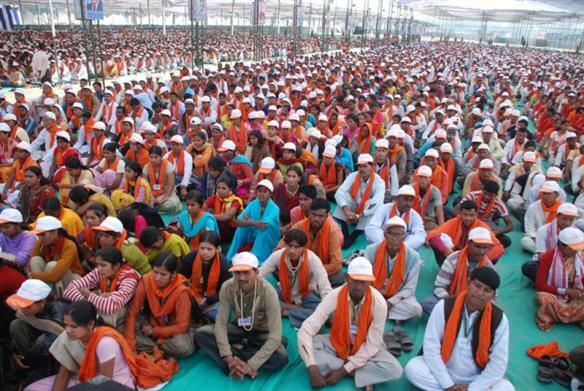 Presence of over 13,000 Vanvasi volunteers from the remotest areas of India exhibited their determination to eradicate illiteracy from the face of India. I was extremely impressed the way Ekal program was conducted. It was a master planning. No chaos. Sitting of volunteers in rows in uniforms was superb. Surya Volunteers, the unsung youth, were the backbone of this huge gathering. The highlight of Ekal Kumbh was the inauguration of Ekal Exhibition by Yogirishi Swami Ramdev Ji. Different states showcased their local products, art & craft items. Ramdev ji in his speech praised the Ekal Vidyalaya Movement for its wonderful work in educating the poor & said that the Ekal education will eliminate poverty & terrorism. I was also moved by the dynamic speech of Sadhvi Ritambhara Ji. She asked us not to rest till all the forgotten children are educated and also urged to convert all the garbage collector children of to day to productive citizens of tomorrow. And I will always cherish the performances of Vanvasi volunteers from different states, Bharat Mata Ki Aarti by Baba Satyanarayan Maurya & especially Jago Hindustani. It is hard to describe the feelings after watching the dances & hearing the patriotic songs of Jago Hindustani. I was touched & moved beyond imagination. The Ekal Kumbh was a source of great motivation & inspiration for me. It bolstered my resolve to work harder for this cause. Experiencing the vibration at the Kumbh, I feel that our dream will see the day light in 2013. We won't stop till we reach our goal. It was an experience to have attended Ekal Kumbh. It was a pilgrimage. I do not have words to express the feelings that I experienced. The 14,000 plus attendees were all charged with zeal, enthusiasm and a feeling of achievement. The venue was the huge Swarna Jayanti Park in Rohini, just 10 miles NE of Delhi. A village was created with tents to accommodate the 13,000 plus volunteers who had come from all parts of India, just as we go for pilgrimage to Prayag to bathe in the Sangam, the confluence of Ganga, Yamuna & Saraswati. All attendees were provided with scarves and caps, that I have here and on the last day they showed off their new dhoti and kurta for men and bright red sarees for women. It was no less than a disciplined army in uniform. The stage and activities were managed by ground level volunteers and they did a remarkable job. Program started on 29th Oct with the inauguration of an exhibition by Baba Ramdev. He extolled the virtues of taking education the villages. He is doing his part in the remote areas of India. Different states showcased the local produce, arts, crafts & more importantly the work books of the children who come to Ekal schools and have benefited greatly. The slogan that Swami Vivekanand extolled over a century ago: 'If the student from remote areas cannot come to the school, then take the school to the children' that is exactly what Ekal movement is all about. It is the brainchild of Late Sri Madanlalji Agarwala, who was moved on seeing the living conditions in the tribal villages. When asked what we can do, they asked for education: not money clothing or food. As the Chinese proverb goes: if you feed a fish to a person, you feed him for one day, but if you teach him how to fish, you feed him every day. How true this is! Also the sansakars of Matra Devo Bhav, Pitra Devo Bhav, Acharya Devo Bhav form a feeling of closeness and value in life. The evening cultural program comprised of folk dances from the tribal areas that the volunteers came from. It was a colorful and exciting program with the performers dressed in their native costumes accompanied with the tunes and sounds of local musical instruments. On the 3rd day, breakup meetings were on the plans of expansion as there is a great need and more so a demand. Villages which do not have an Ekal school want one! It has also been witnessed that many students would rather attend an Ekal school than a govt. one, where the teachers come to earn their salary and not for imparting education and sanskars to these children of 6 to 14 yrs! The common sessions before lunch focused on how this has led to social transformation and after lunch the discussions were on empowerment education. The delegates expressed their thoughts with a great feeling of achievement & satisfaction. Beginning at 7pm were the tribal dances, as all could not be covered yesterday. The highlight today was "Jago Hindustani" a great cultural presentation of singers and dancers with patriotic songs., tracing the history from the days of King Ashok, to the atrocities of the Britishers, more so the massacre at Jalianwala Bag and the fight for freedom. One had to be physically present to feel it, I lack words to express. The program went beyond 11 pm today. The theme of Jago Hindustani does not end here. We have to continue to be aware of the evil elements in the world, fight the evil forces, have faith in ourselves and work in harmony, a unification that Ekal has shown with its humble efforts. On the fourth and last day, as is normally done, future plans and programs were discussed by different regions. 2010 will see Yuva Bharat Abhiyan, i.e. Youth Movement, and expansion of the field force. In the common session, stress was on Swavalamban: self dependency. Each chapter will focus on one activity. 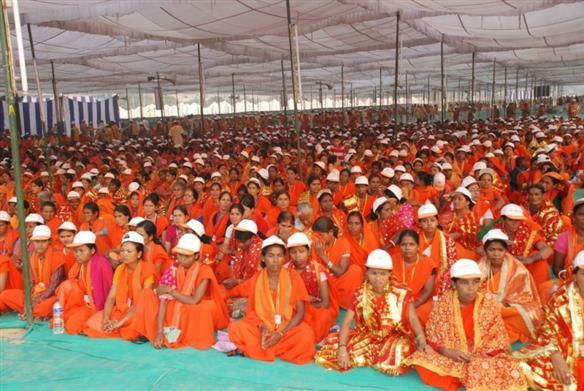 Value of Swabhiman: self respect was discussed and witnessed. A nice new definition has evolved: What is Ekal? It is a bridge between the vanvasi and the well established population. Ramesh Shah, Chairman of Ekal Foundation of USA, also went to the Kumbh along with several other delegates from US & Canada. He spoke on behalf of you all expressing thanks to the organizers and the vanvasis for a great program and the satisfaction we get in making their life better! From the current number of 28,000 schools, the target is to have 100,000 by March of 2013. Seeing the zeal and involvement of NRI's to give back to the motherland, there is no reason why this cannot be achieved and the Ekal movement continues to seek your support! I strongly recommend that you visit the website www.ekalkumbh.org. You will be thrilled! More is being added every day. After all it is all run by volunteers! 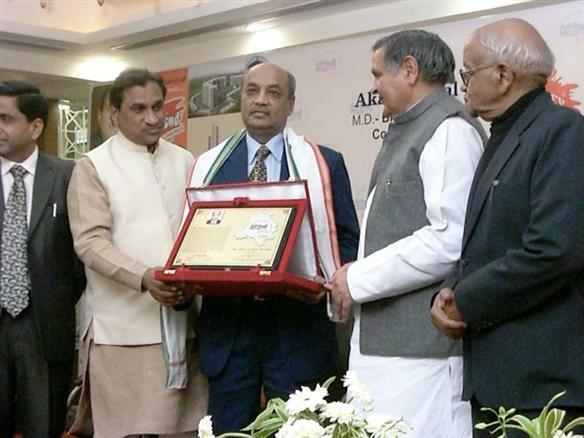 Ekal Vidyalaya received the 7th Meri Dilli Award in the field of Literacy on December 19, 2009 in a glittering function. 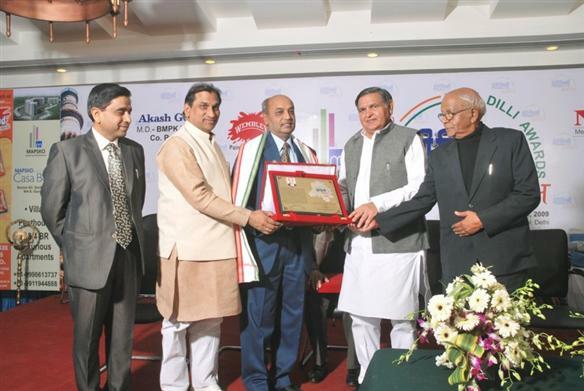 Dr. Yoganand Shastri, Hon'ble Speaker of Delhi Vidhan Sabha, conferred the award to Sri Vijay Maroo, President of Ekal Vidyalaya Foundation of India. The Meri Dilli Awards have been instituted by the NNS Media Group, which publishes newspapers and magazines and organizes exhibitions. The NNS Group was established in 1950 and has been organizing the Meri Dilli Awards for the last six years. Amongst the awardees this year some other prominent names are Padmashri Shovana Narayan, IAS and a Kathak Guru, Ashok Chakra winner Amar Shaheed Late Mohan Chand Sharma, Padmashri and Dronacharya Awardee Guru Satpal, Padma Bhushan Dr. B. K. Rao, Ms Ekta Chaudhary, Miss India 2009, Sri B. V. Selvaraj, IAS, Principal Secretary - Urban Development, Govt. of Delhi. Lions Club of New Delhi, Alaknanda District 321 A-1, Club No-5337054251 has been making regular contribution to Friends of Tribals Society (FTS) towards sponsorship of free education per child on daily basis from 1st July onwards. Total number of students sponsored from 1st July 2009 to 12th December 2009 is 165.